In this section, we are collecting and publishing news focused on treatment-free remission in CML on a regular basis. We offer you to check the "News on TFR" section to be informed about latest advances in stopping treatment for CML patients. Second-generation tyrosine kinase inhibitors (TKIs), including dasatinib and nilotinib, are better at inhibiting BCR-ABL kinase activity than the first-generation TKI imatinib mesylate. Second-generation TKIs were introduced initially as a second-line treatment for the patients with disease resistant or who were intolerant to imatinib and resulted in a remarkable response rate.1 Because subsequent studies demonstrated that second-generation TKIs show superior efficacy to imatinib for newly diagnosed chronic myeloid leukemia (CML),2, 3 their use as a first-line treatment has increased. Although accumulating evidence has shown that discontinuing imatinib is feasible, trials of patients receiving second-generation TKIs are lacking. 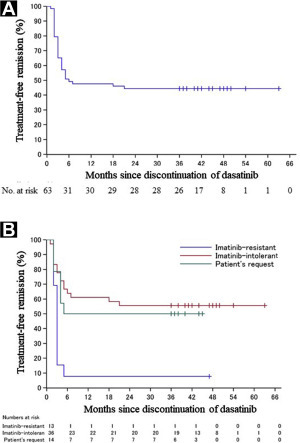 Therefore, we conducted a phase II trial to investigate whether long-term TFR was achievable after discontinuing second- or subsequent-line dasatinib treatment after imatinib resistance or intolerance (the DADI trial [dasatinib discontinuation]). We have confirmed the feasibility of dasatinib discontinuation in patients without imatinib-resistant disease who maintain MR4.0 for ≥ 1 year. Moreover, we have demonstrated that both the characteristics of leukemia cells (an intrinsic factor) and the host immunologic responses (an extrinsic factor) are involved in maintenance of TFR. These findings could be useful for identifying patients who will derive the greatest benefit from TKI discontinuation and enable optimization of the algorithm used for treatment of CML patients taking TKIs. BCR-ABL1 tyrosine kinase inhibitors have dramatically improved outcomes for patients with chronic myeloid leukemia, and current studies are investigating whether some patients may be able to suspend therapy yet maintain response in a state known as “treatment-free remission” (TFR). Results from ongoing studies suggest that ≈ 40% to 60% of patients in sustained (generally ≥ 2 years) deep molecular response (defined as a 4-log or deeper reduction in BCR-ABL1 transcripts, depending on the study) who attempt TFR may successfully remain off treatment. Results from TFR clinical trials, patient considerations for attempting TFR, and potential predictive factors associated with successful TFR are reviewed herein. FDA News Release. December 22, 2017. The U.S. Food and Drug Administration has updated the product label for the cancer drug Tasigna (nilotinib) to include information for providers about how to discontinue the drug in certain patients. Tasigna, first approved by the FDA in 2007, is indicated for the treatment of patients with Philadelphia chromosome-positive (Ph+) chronic myeloid leukaemia (CML). With today’s updated dosing recommendations, patients with early (chronic) phase CML who have been taking Tasigna for three years or more, and whose leukaemia has responded to treatment according to specific criteria as detected by a test that has received FDA marketing authorization, may be eligible to stop taking Tasigna.